Wagner’s newest ad channels Trump’s message on the caravan, while a new F&M poll shows comfortable leads for Casey and Wolf. Here is the Playbook. PA Gov: Echoing Trump, Wagner Closes with the Caravan: The ad states Gov. Wolf is “laying out the welcome mat” to the “dangerous caravan of illegals” heading to the U.S.
F&M Poll: Casey Leads by 15, Wolf Up 26: 54% believe Wolf is doing an excellent or good job, while 43% polled for Casey fall in these categories. PA Gov: Wagner Makes Push for Philly Voters, Wolf Touts 4 Year Record: Wagner accuses Wolf of neglecting Philadelphia, while Wolf boasts about first term achievements. Biden To Campaign in Luzerne County On Sunday: The former Vice President will be joining Sen. Bob Casey and Rep. Matt Cartwright. CBS Places 5 PA House Races in Closest Watched List: They have PA1 under their “Affluent suburbs” section, PA8 and PA10 under their “Blue Collar or Rural” section, and PA7 and PA17 under their “swingable suburbs” category. America First Policies Digital Ad for PA10: The Pro-Trump PAC launched a digital ad campaign today urging voters in Pennsylvania’s 10th Congressional District to vote Republican on Election Day. Their sister organization, America First Action, has spent $722,000 in PA-10. This ad shows Donald Trump Jr. boasting about the Trump agenda and the need to elect Republicans nationwide. Former GOP state Senate endorses George Scott: Retired Republican state Sen. Patricia Vance endorsed Democratic candidate for the 10th Congressional District, George Scott. In a letter to PennLive, Vance, a registered nurse, cited Scott’s advantage on the healthcare debate over incumbent Rep. Scott Perry (R-York). The Scott campaign also received an endorsement of former GOP state Rep. Steve Nickol, detailed in their campaign’s new ad here as the former GOP lawmaker sits alongside Pennsylvania Auditor General Eugene DePasquale. SD-38: Republican state Senate candidate, Jeremy Shaffer releases a video ad on his Facebook calling out the shooting at the Tree of Life synagogue in Pittsburgh that resulted in 11 deaths and stating Pennsylvania needs to strengthen it’s hate crime laws. Don’t see news from your campaign, or an article from a local news outlet in our legislative elections list? 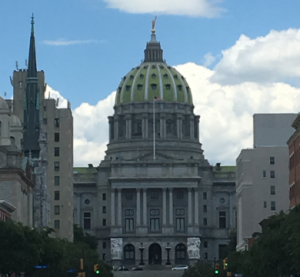 Add press@politicspa.com to your list and send us your updates! Philly Clout: Joe Biden is raising money for Rep. Bob Brady … for a 2022 Senate run? Inquirer: Trump wanted a referendum, and new poll suggests he’s losing it in Pa.
Inquirer: Is GOP attack ad in Pa. legislative race anti-Semitic? Democratic candidate says yes. Billy Penn: Explaining the issues: Who calls the shots, from Philly to D.C.
Inquirer Editorial Board: Prediction: Convicted felon will win state house race in Pa.
Will Bunch: Stop blaming millennials for not voting. Blame America’s screwed-up system — and fix it! Wolf’s 26 point lead in the Franklin and Marshall poll has to be a gut check for all future candidates for Governor. It would seem clear to me that if you are that far behind the campaign was a total fiasco. What else could be said. While clearly the fault lies with Scott Wagner with his string of mistakes culminating with the “golf spikes” Facebook post, it also can be said that a well funded campaign alone cannot over come little political experience and minimal political skills as was found with Wagner. There are a lot of lessons to be drawn from the Wagner debacle. Well, unless your name is Donald Trump, it can’t overcome being an as++ole.